Why every researcher should keep an old bulletin board. I recently found a short article my father wrote for National Fisherman, in 1988, which reported on a new kind of lobster trap with a “catch escape panel” aimed at reducing bycatch. My dad had a steady freelance gig at the time with National Fisherman, and the article was one of several he wrote while researching “ghost traps” – lobster traps, specifically, but really any lost fishing gear (nets, lines) that disappears underwater for reasons random, accidental, or deliberate. With lobster traps, it’s easy to imagine what happens. To retrieve traps and the lobsters in them, a fisher works her way along from floating buoy to buoy. 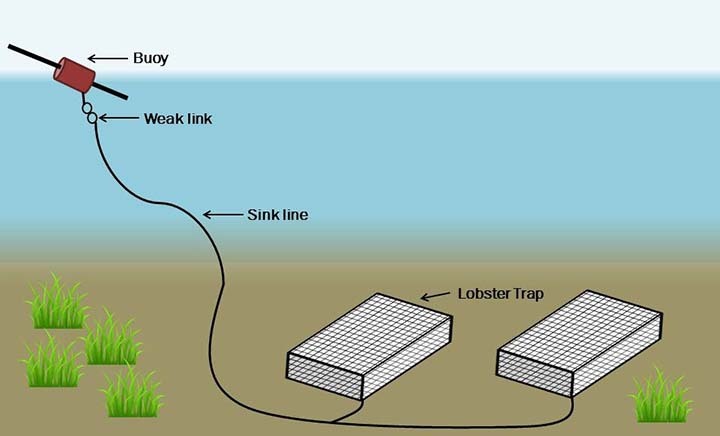 Each is connected to a heavy “sink line” that is in turn fixed to a trap, which sits on the seabed, catching lobsters. If something – a propeller from a passing boat, for example – parts the sink line, then the buoy drifts off with the current and the trap is lost. And yet the trap keeps fishing. Hence the term “ghost fishing” – the work of lost gear that continues to catch whatever hapless critters get stuck or entangled and die in it. I went looking for literature on ghost fishing because I was chasing an analogy. During the past two years I sank a huge amount of time, effort, and energy into grant proposals. Two I led outright: one was a solo bid that died by faint praise; the other garnered six peer reviews, required a formal reply, went to a decision panel, and ended there. A third proposal I prepped but couldn’t launch. A fourth, to begin an international collaboration, earned an achingly polite rejection letter. And I was aboard three major consortium grants, each involving tens of collaborators. (Two failed, one hit.) Until this past December, when a couple of articles came out in print, there was little to ink 2016 into my permanent academic record. And that’s “ghost research”: the drafts you write and revise and circulate to collaborators and revise and recirculate; the emails and meetings and Skype chats and phone calls you have with partners and colleagues; the careful bartering you do with impossibly patient finance-office staffers – all the work you invest in proposing a project that will only exist formally if funded. Which means the research seafloor is piled high with ghosts. Fishers hate losing gear. Their hearts are in their job, and losing gear is expensive. A trap lost is a trap that needs replacing – along with its weights and hardware and line and splicing and buoy and fresh paint. Even funded grants are ephemeral – all traps eventually need replacing. But they do help pay the grant fisher’s costs, and the best bait for funding is evidence of previous funding. So there’s a limit to how much ghost research a person can generate. Balance sheets can’t run in the red indefinitely. Maybe, unlike a ghost trap, a ghost project that “keeps fishing” is a good thing – maybe it resurfaces some months or years later, all tangled up with other ideas; maybe it gets dragged up from the depths by surprise when you meet a new colleague or start working on something seemingly unrelated. It is possible to flip unsuccessful proposals into articles, which I’ve tried. Articles form the basis of a researcher’s track record, which in turn constitutes (as an abbreviated CV) the frontispiece of most grant proposals. Haul up an empty trap; re-bait; set again. Ghost research is as inherent in research as ghost fishing is in fishing. Things get lost. Not everything you do can (or must) be kept. But maybe the research process needs a “catch escape panel,” too – a way for scraps of work to resurface when they might otherwise vanish. No one else needs to know exactly how much ghost research you have drifting out there, but maybe it’s important that you know where to look if you had to find it. I recommend unearthing one of the faded old bulletin boards buried and forgotten at the back of the departmental supply closet. Pin up the ephemera of your ghost research – names, phone contacts, notes, cost estimations, scribbled diagrams with unlabelled axes. Collage them, let them accumulate. Every couple of years, rearrange the board. Haul up an empty trap; re-bait; set again. Bulletin boards are great. Here’s an additional suggestion: file folders. Any document pertaining to one’s “ghost research” should be saved in its proper file folder, appropriately labeled. One storage-oriented store I shop at has file folder labels which can be erased and re-titled as needed. For better or neater organizations of some of those documents, a mail-order catalog I buy from has a system which enables you to hole-punch those scraps of paper and put them into one of their proprietary disc-binders. These come in different sizes and have divider options.